All of these items aren't easily available in stores, but I found them at Make Cheese located in Alberta. The best and most popular cheese making site I've found is the New England Cheesemaking Supply Co. The only reason I didn't buy from them was because I wanted to buy in Canadian dollars, but that site is a gem of information! Cheese Forum: (I just joined this weekend, I don't know how active it is, but there is a wealth of information here from beginners to experts on cheese making). Mozzarella Cheese Making Video (20 minutes): I watched this video over and over to get the technique down and I'm so glad I did. I followed both the PDF recipe and watched her video as I was making the cheese. I think it's important to really de-stress, take your time, read the recipes and watch the videos before you start because it's too easy to forget a step! Step 1: Acidify Your Milk; Heat; Add Rennet: To acidify the milk, I added the citric acid; then heated it to 90F. It looks like this when it's ready, starting to curdle slightly. The next step is to remove the milk from the burner and add your rennet. You leave this sitting for about 20 minutes and a solid mass should form. Mine wasn't a solid mass though (see photo below). Then you take the curd off the heat and put it in a colander to drain (KEEP the whey!). 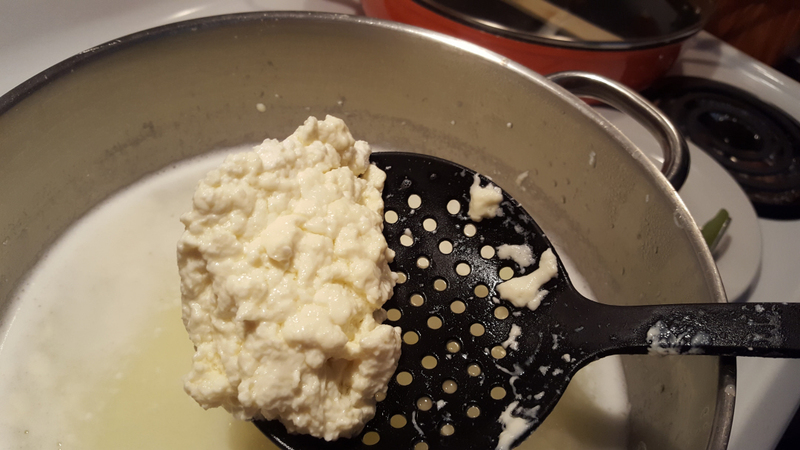 My curd looked more like ricotta, but felt like soft Mozzarella (more rubbery than Ricotta). It's supposed to really look like solid pieces. Step 3: Heat the Curd, Stretch; Form Balls: At this point, you need to heat the curd, stretch and form the Mozzarella. Nearly every recipe I found online suggests using the microwave at this point to make things easy, but I wanted to do it the "real" way...which is something I had in common with the lady in the video! I really suggest watching it to its entirety if you want to do the "water bath" method of prepping your cheese for stretching! At this point, you heat up your leftover whey to 185F. 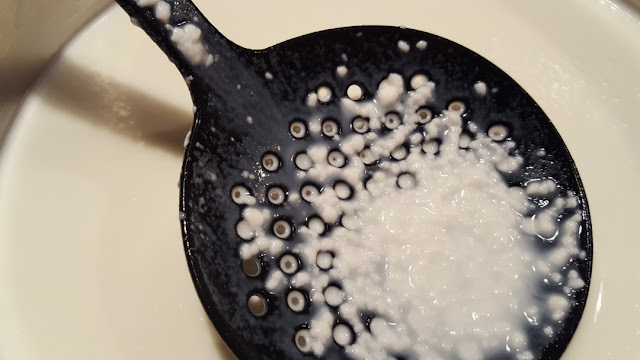 I added about a tablespoon of cheese salt to the whey to salt up the cheese a little bit. 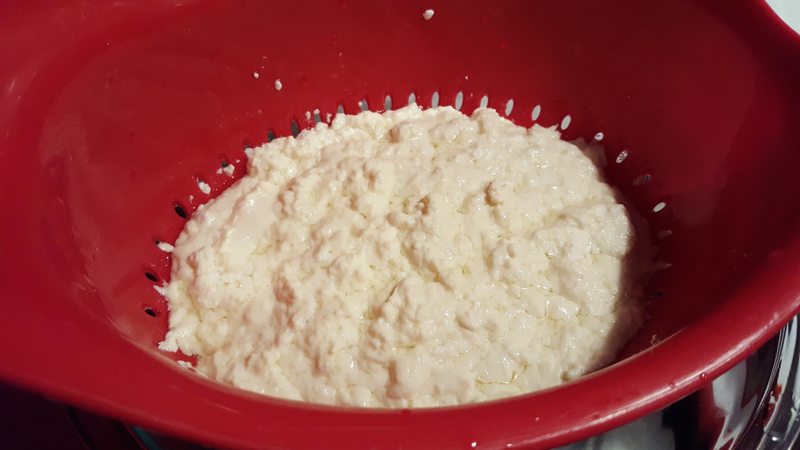 Then you scoop out about 1/6th of your curd and dip it in the hot whey "water bath" for about 15 seconds. THIS is the learning curve. I chose 15 seconds, some people may need longer - it all depends on the consistency of your curd. :)) I succeeded!! The cheese could have been more solid and it shouldn't have all those craters and cracks in it, but it was very nice! 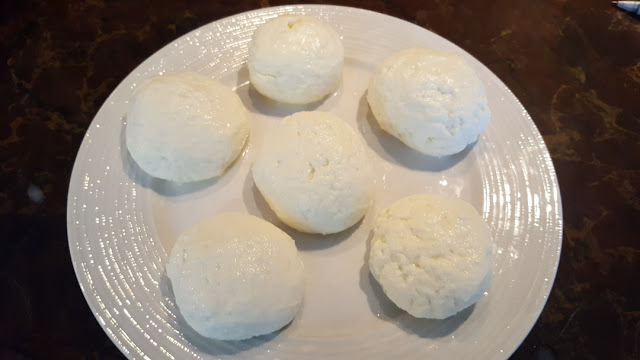 I put these Mozzarella balls into a cold water-filled container in the fridge for 3 hours before using it - this is supposed to harden it up a little. This cheese keeps for 10 days in the fridge. 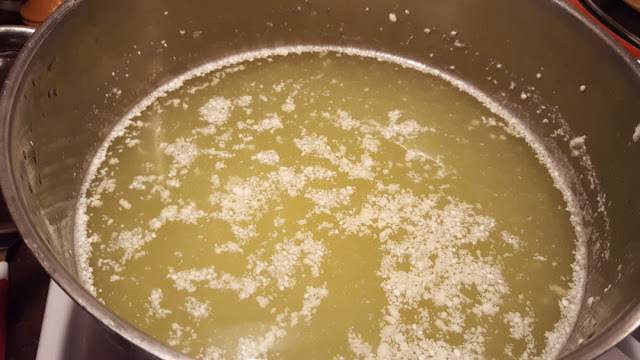 After the 3-hours, I transferred the cheese into containers without brine, as was directed in the video. I used 2 of them for our pizza. After being used to the "cheese food" Mozzarella from the grocery stores, it takes some getting used to, flavour and texture-wise. If I'm completely honest, we do miss the greasy type of brick style Mozzarella for our pizzas. This real cheese melted quite well though and gave a nice creamy texture. 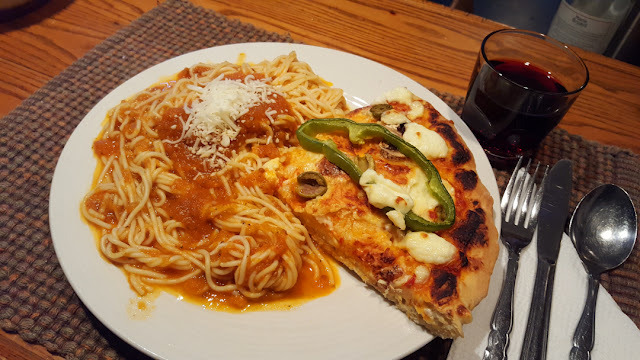 I made my Pizza-Ghetti for dinner. I see why cheese making is called an art. It takes practice, time, the ability to be flexible and patience. 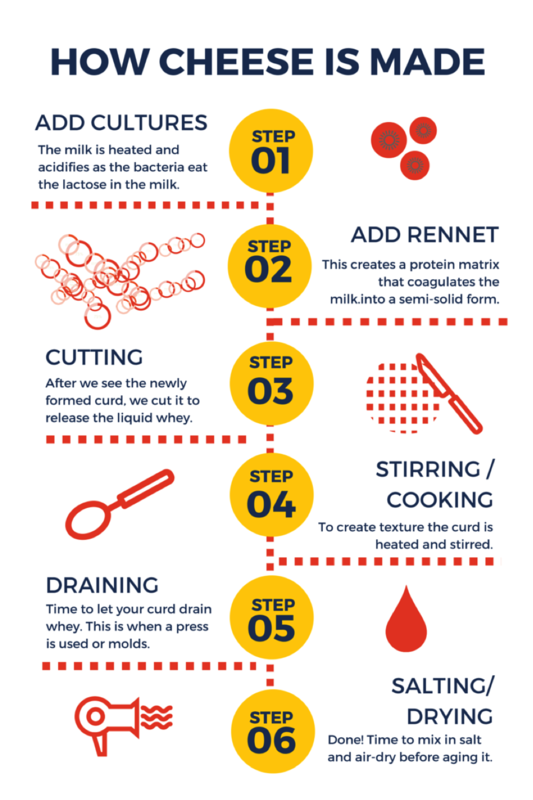 We all have access to different milks, rennets and overall ingredients. Not to mention when aging comes into the process, humidity levels and temperature! I have to find what's right for me with the products available! Next time I will try a little less rennet, diluted in more filtered water and add lots of cheese salt. I will NEVER give up because I really enjoy this new hobby! I found a recipe for a Mozzarella Made With Live Culture. 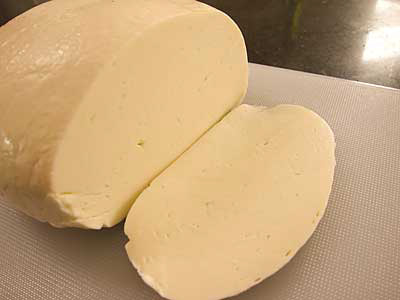 (pictured to the left) This is a cheese that the author of the recipe makes as "pizza cheese". I really like the fresh Buffalo-style Mozzarella, but we mainly use this kind of cheese in melty dishes, so I'm making it my mission to try to make a homemade pizza Mozzarella! Rain, well done! Very exciting that you took the plunge and had such beautiful success. And you are correct that it is an art. You'll find that you notice differences with the things you do and the way you treat the milk. But that makes it fun, so keep good notes! I find that grated fresh mozz freezes very nicely too. Wow, well done! And brave, too. Even though I've been cooking and baking for almost 30 years, I'm still intimidated by things like this. This is indeed an art and yours looks terrific. And homemade pizza! YES! Love that. When I was a kid we used to do this regularly as a family. My job was to add all the toppings after my mom rolled out the dough. So much fun. Good memories! Hi Rain, lovely post. It's really good to be able to see what you're doing there and to get an explanation of it all. Cheese making at home! Someday, someday. Maybe this winter will be the time I take the plunge. If so, I will be right back here reading at your first entry and on studying what you've done. (I actually bought a cheese press a couple of years ago thinking I wanted to learn the art of making hard cheese.) I know this blog will be an encouragement for many of us readers, so keep it up! Thank Leigh!! I did take the plunge and it was really challenging! I'm just insecure by nature so I found it hard, but I will try another Mozzarella tomorrow I think! :) I am keeping good notes...I want to really make this a big part of my life now. It's so rewarding, but really challenging! :) Thanks for the tip about the freezing. I've read everywhere not to freeze fresh Mozzarella, but they do on pizzas, so why not? Thanks Dianna!! :) You know, that patience thing is key. That's where I went wrong. 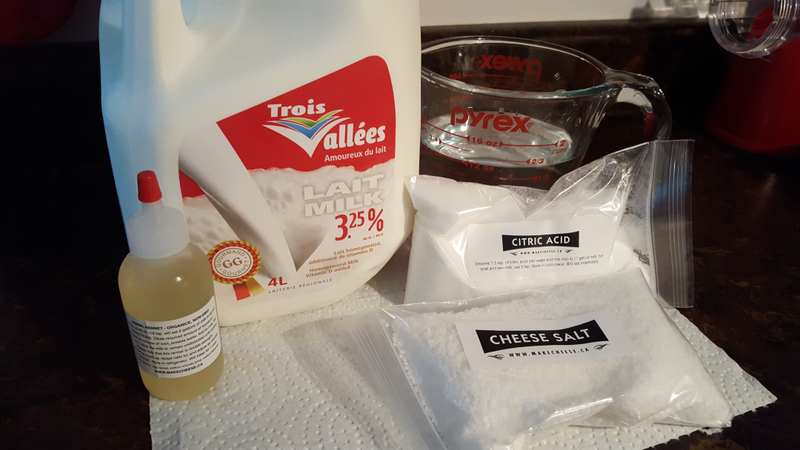 I did do my "due dilligence" but neglected to read bottles...the rennet that makecheese.ca sells is double strength and I kind of knew that in the back of my head when I bought the stuff...but didn't double check. Measure twice, cut once as they say! I realized after I mixed it in the water, so I had to start over. You could start with some easier cheeses like Ricotta, cream cheese and even the Mozzarella if you use the microwave method, it looks less complicated than the water bath method I used. I was originally going to follow this recipe Homemade Mozzarella, but when I watched the video using the water bath method, it peeked my interests! I'm not stopping even though it's challenging, so keep watching and I hope it motivates you!!! PS: the cheddar kit has lots in it and the instructions are 8 pages long lol...not to intimidate you, just to prepare you! But I'll be making that hopefully on Friday! Thanks Nik!! :) The grocery store Mozzarella that we used to buy, not the brick fake one, but the balls, were called Bocconcini, which is the same thing. Now that I've tasted mine, even the Bocconcini is rubbery and tasteless. I'm really happy I started this! 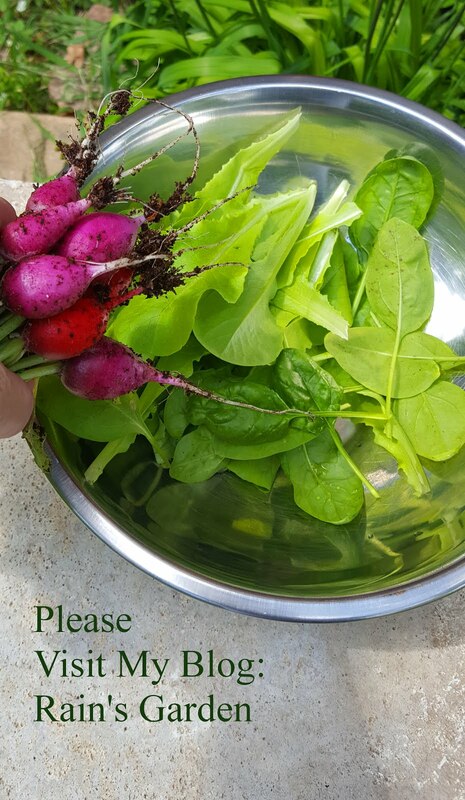 Ah yes, the next batch will be used mainly for fresh eating! I have to try that cultured Mozzarella for melty pizzas and other dishes though. Nik, I know what you mean. The "cheese product" that passes for cheese in the groceries stores, I don't even know what that is lol...we don't buy it anymore. That's what got me interested in cheese making - reading those ingredients. Lots of people don't have access to a cheese shop. Also if you compare a brick of fake Cheddar to the real stuff, the price difference is outrageous. I've said it before, everything that's good for us is most of the time out of our budgets! I upped my cheese budget so every month I have a certain amount, we buy good cheese from a cheese shop and if we run out, we run out. But yeah, the real Mozzarella is so much nicer. I just need to figure out how we like it the best! And I want to make a saltier one for pizzas. I know of a gal who regularly makes several different kinds of "hard" cheese and she uses a spare refrigerator in her basement as her "cheese cave. I know nothing of hard cheese making, but she apparently makes the refrigerator work successfully. Hi Mama Pea :) Coincidentally, this morning I've been reading up on how to rig an old fridge for a cheese cave! It all has to do with keeping the humidity and temperatures at the levels you need. I'm not sure if it's wise for us to buy another fridge right now, even a used one...just because we'll have to lug it with us in a few years when we move...but if I'm really getting into this on a regular basis, it might be a good idea. I'll have to keep an eye out for second hand ones...even a small "bar" fridge would work. I have to think about this because I really want to be successful! LOL Mama Pea, I NEED some enabling...I'm extremely thrifty at times...blame the Scottish ancestry lol...maybe just a small used fridge. And you're right, it would be a good investment considering I just made a plan for multiple cheeses this year! That is wonderful, making your own cheese. I wonder why it tastes so different from store bought. I made cheese once. I wonder if I can find the recipe. It was milk, lemon or maybe vinegar, then flavoring: garlic and basil, another was salsa, or plain. It looked kind of like yours, but crumbled easily. Wishing you a grand time making cheese! Hi Tammie Lee :) I think the store bought stuff has so many additives and preservatives that it kills the flavour. Or there is so much salt that it alters the flavour. My Mozzarella has a fridge life of 10 days. Even if I buy Bocconcini, sometimes the "best before" date is months away, which always baffles me. Homemade Mozzarella (Second Try) SUCCESS! 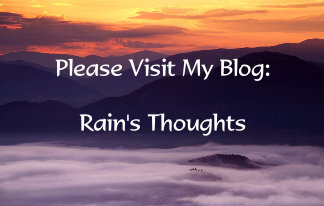 NEW BLOG! POSTS TO FOLLOW SOON!